This very handsome, mid-block apartment tower was built in 2000 and quickly became a significant new component of the west skyline of Central Park. Designed by Beyer Blinder Belle and Costas Kondylis, it has a nicely detailed red-brick façade with white detailing that enhances the vistas of the Upper West Side from Central Park as it partially blocks views of a very large, beige-brick apartment building just to the west of it on the same block. The 41-story tower has 53 condominium apartments ranging in size from two- to four-bedrooms. The building is adjacent to the McBurney School and it incorporates and preserves its landmarked, Romanesque-style façade and has a limestone garden entrance. Its apartments start at the 12th floor. The tower was erected above the western end of the West Side Branch of the YMCA that was designed by Dwight James Baum in 1930. The tower's plan in 1987 met with considerable opposition from some neighbors and some preservationists who feared it might clash with the Romanesque and Gothic details of the YMCA building, which was not an official city landmark. The project was put on hold when the economy faltered but it was revived in 1997 and opposition was less severe. The 438-foot-high building is clad in a light red brick that nicely goes with the South Carolina pastel brick of the YMCA building. Surprisingly, the authors of "New York 2000, Architecture and Urbanism Between the Bicentennial and the Millennium" were not very enthusiastic about the finished building, noting that "the narrow, four-bay window, stepped-back tower, with cast-stone trim and cornices, rising to a prominent, pyramidal top concealing the building's mechanical dquipment, was a dud, giving off an unwelcome blankness of effect." While the building is not a tour de force it has an unusually cozy relationship with its angled and tall neighboring apartment building just to the west whose wings seem to enfold around it. Not surprisingly, of course, this building obstructs many of the vistas of Central Park and the midtown skyline from the other building, which has never been very popular with some architecture observers. The contextual relationship with the YMCA are noteworthy as is its attempt to add another distinctive top to the West Side skyline. 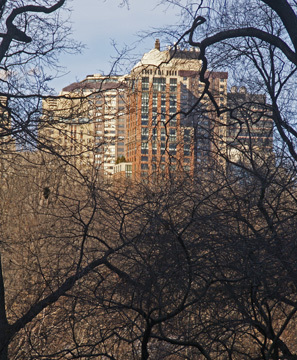 Many apartments have stunning views to the east of Central Park. The building offers a fitness center, a children's playroom, a bicycle and carriage room on the first floor, and a concierge. 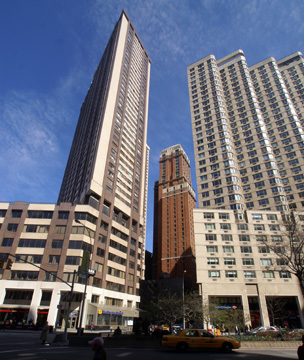 The building, which has some terraces, is very close to the Lincoln Center for the Performing Arts and this neighborhood has excellent shopping, many restaurants and good public transportation.